Quiche, pronounced keesh, is a French, savoury open tart consisting of pastry crust, filled with eggs, milk or cream, and cheese, meat, seafood or vegetables. Discover a new twist I made to this French favourite with Greek cheeses. 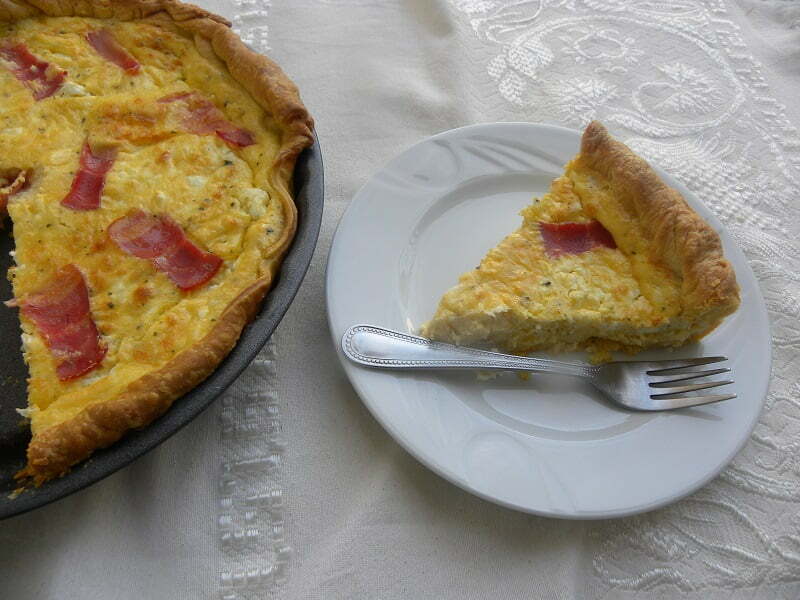 I made this Greek-style Quiche during the Christmas holidays, using feta, graviera cheese and some bacon. To make the quiche I used store bought pastry called Kourou, which is a Greek short-crust pastry, which is suitable both for savoury and sweet creations. I bought the Kourou before the holidays, as I was intending to make a turkey pie with the leftover Stuffed Turkey, but after thawing the pastry, we decided that we wanted a curry with the leftover turkey. As I had already thawed the phyllo pastry, I had to use it. I did not have enough cheese to make a classic Greek Tyropita, so I decided to make a Quiche, using ingredients I had at home. The package has two sheets of phyllo, so I used one for the quiche and I made an apple pie with the other. The sheets are rectangle, so on both sides they were longer than the other two sides. I did not want to cut it around the rim, so I crimped* it on the two sides. In the quiche I added some of my Gourmet Salt I made with mint, which added a very subtle taste of peppermint, which pairs well both with feta and graviera. If you don’t have any salt with peppermint, you can add regular sea salt and crumble 1/2 tsp mint. The quiche was easy to make and my family loved it. It was light and the combination of these two Greek cheeses with bacon made it divine. Leftovers were great, which we enjoyed during brunch the next day. If you want to make the dough from scratch, you can use my Basic tart shell, or Kourou pastry. In order to crimp the pastry, use both hands and twist the leftover phyllo inwards, over the rim of the pan to create a scalloped effect. Whisk the eggs with a hand mixer. Add cream, feta, graviera, salt and pepper and mix. Stop and press with mixer paddles to break feta into smaller pieces. Brush the tart pan with olive oil. Line a 23 cm / 9 inch tart pan with the kourou phyllo. Gently empty the mixture over the phyllo. Add the bacon on top. Preheat the oven to 180oC / 350o F and bake for 30 minutes or until the phyllo is golden on top. Let it rest for ten minutes and then cut into slices. Thanks Val, everything in moderation. Hi Ivy, This quiche looks amazing. Personally, I think “kiss” is a much more fun name for this dish – very cute! I loved your blog site. Passed by accidentally but stopped by to read. Its fascinating. Greetings to you from Botswana. Hola Ivy. Great job!!! I love feta! Have a great day! Hi Ivy! So glad you made the quiche. It’s one of my favorites but have never made it with feta. Will try it next week! Hi Nicole, I am glad you like quiche and hope you will try it.